The menu here offers some true winners—and several could-be-betters. Inspired by Trastevere, the 13th district (or rione) of Rome, Ethan Stowell’s latest endeavor lives in a casual, spirited corner dining room on the east side of Capitol Hill. 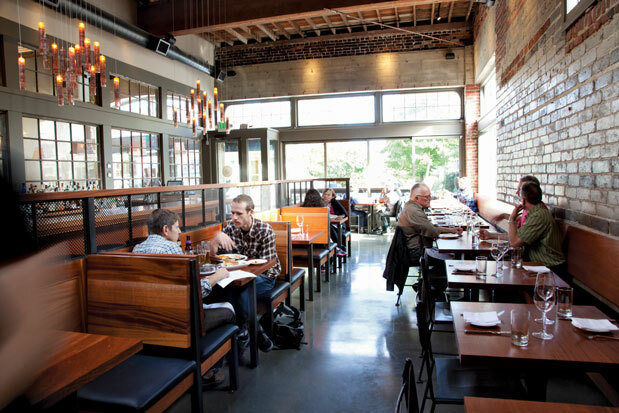 Like Staple & Fancy Mercantile, Stowell’s Ballard restaurant, which shares a space with another eatery, Rione cohabits with The Wandering Goose café; an interior wall of reclaimed windows divides the two. And, as at Staple & Fancy, the menu here offers some true winners—and several could-be-betters. Among the former: a perfectly cooked veal chop wrapped in crisp prosciutto, the veal inside still plenty pink, with sautéed escarole and fried sage leaves ($28). The bucatini Amatriciana—think thick spaghetti but hollow—is outstanding, dressed in a thick, unctuous sauce of guanciale (cured pork jowl) and tomato with a subtle chile backbeat ($14). But then there are fried baby artichokes that had spent a minute or two too long in the fryer, and a radicchio salad in an anchovy dressing that was so acrid with raw garlic I worried I’d smell for days. Better: the cacio e pepe ($14), a traditional Roman pasta wherein cacio (Pecorino Romano cheese) and pepe (black pepper) work their wonders on tonnarelli pasta, a thicker, square-shaped spaghetti, that, as with all of the pasta here, is made at Tavolàta in Belltown. I just wish there hadn’t been such a large pool of butter at the bottom of the plate; cacio e pepe is a dish that’s meant to be on the dry side, an ideal foil for good Italian red wine (to that end, you’ll have good options in the $8–$12 per glass range). Service does a good job of handling the crowds; you’ll likely need a reservation for prime-time tables. Overall, as with many of Stowell’s places, I’d happily go back—not because it’s great, but because it’s fun, likable and I know now what’s best to order.